Last week I joined a Waldorf Home Schooling group, but as it turned out most of the members are an hour drive away, so a little too far for us to join in on the weekly gatherings. I am however enjoying the weekly group emails, and invites, and even though I am not physically attending the group I have already been inspired. One of the activities last week was to create a healing basket for the home. I read only a brief statement about what this would be, but it was seed enough to plant an idea. 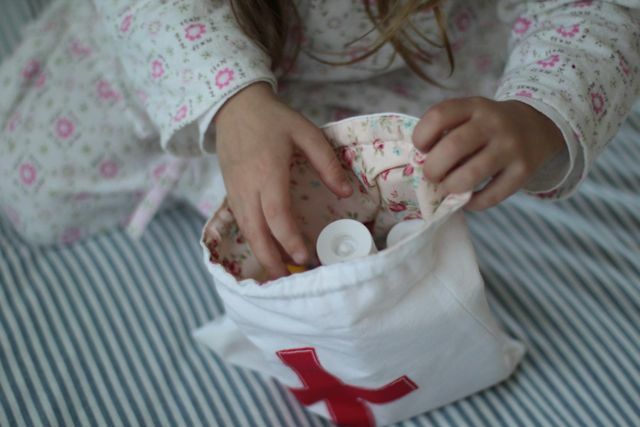 I loved the notion of a healing basket, and started to visualise a little woven basket with herbs and ointments and remedies to help little ones through the rough knocks and bumps of daily life. The small basket that came to mind, was not something that we already owned, and I really try not to go out and buy things like this, so my mind started thinking of something else….a bag maybe? Yes, a fabric drawstring bag that I can take with us places? Yes, that is a great idea, a homemade fabric bag, that is small so I can carry it in my handbag, and I can take with us on hikes. 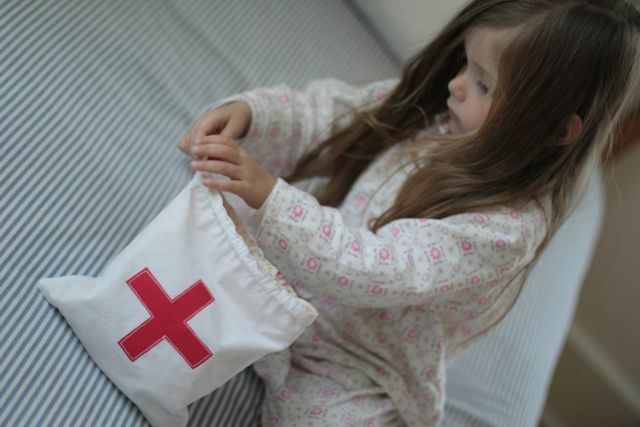 Yes, a first aid, healing bag! The timing of creating such a thing seemed just right. With warmer weather lightening our day, there will no longer be the protection of the layers of heavy winter clothing. Warm days means more outdoor play, which brings with it scrapped knees, scratches, bumps, bruises bites and stings. This year I am going to be prepared! I want to be able to help the Girls through their injuries and woes, and I also want to teach them the natural remedies to heal their bodies. So this afternoon I went to work sewing a bag. 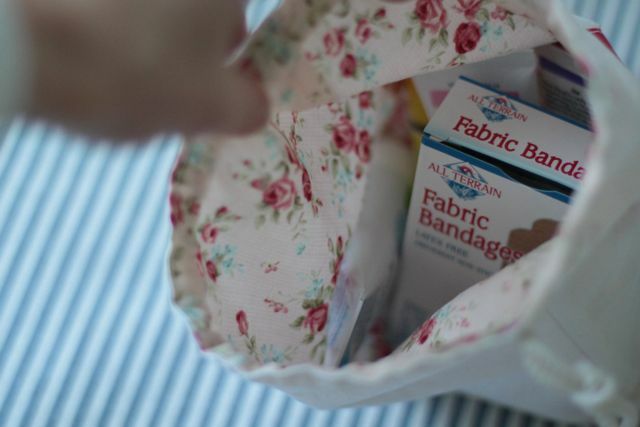 I wanted it to look like a first aid bag so that it was universally obvious and I could say “Grab my first aid bag” but I also wanted it to be a heart felt healing bag…so I made it reversible with two fabrics. 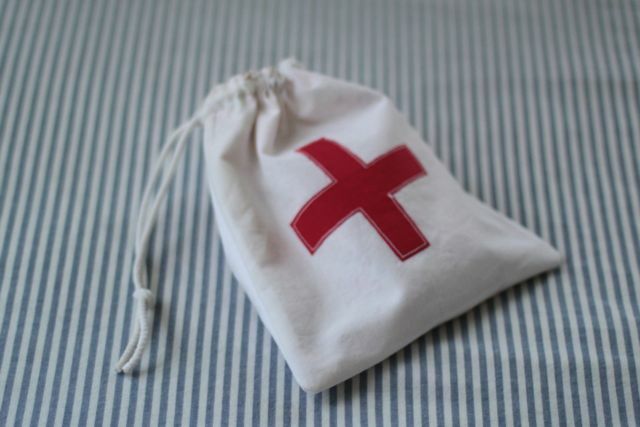 The white with a red cross for first aid, and the rose print for healing, nurturing and love. I was able to find many wonderful things to put in our healing bag from Whole Foods, and I am sure any natural food store, or health store would carry similar. Bellow is a list of what I have or will have to fill our bag with. 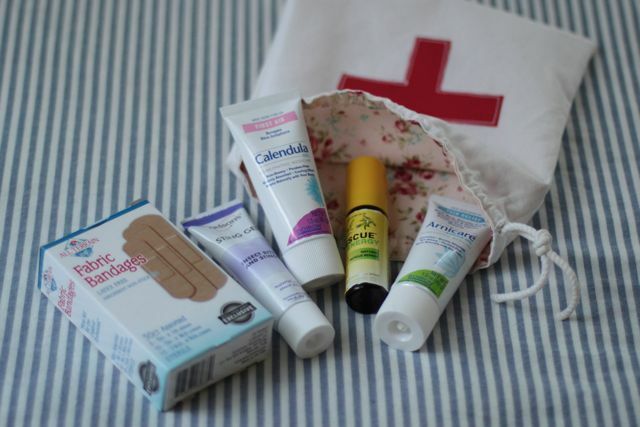 Would love to hear of any other natural remedies you use or can suggest for our healing bag. Boiron Arnica Gel: A homeopathic gel for muscle pain and stiffness, swelling, and bruising. Boiron Calandula Gel: A homeopathic gel for scrapes and skin irritations. Nelsons Sting Gel: A homeopathic remedy for bites and stings. Bach Rescue Remedy: All natural bach flower remedy drops that can reduce everyday stress. Effective in virtually any situation that causes stress or anxiety. Helps restore a sense of calm and control. This entry was posted in C R E A T E, G E N E R A L and tagged health. Oh Kirsten, I especially love this post… love love love it! I have been working on our kits here at home too, because I realised that most things have become out of date or have depleted, and I want to have all the essentials in our home, our car, and our caravan. There are a few things I could offer as a suggestion to add to your bag. A little gauze and saline to clean a scraped knee which is full of dirt, saline is also good for flushing an eye, a compression bandage for snakebite, bleeding or a sprained ankle, and a pair or two of disposable gloves. I love your idea of the healing bag… I think you have planted a seed here too! Thanks for the added suggestions, I will add some gauze and saline for cleaning out dirt from scrapes and scratches…thank you! Glad I do not have to worry to much about snake bites any more, but will add a compression bandage for sprains. Good idea! Great idea Kirsten. We have a little basket with similar things in it, but I like the idea of having a to go bag even more. And of course it is lovely and sweet, like everything you make.